Solution for developers to host Excel program in a window or web page. 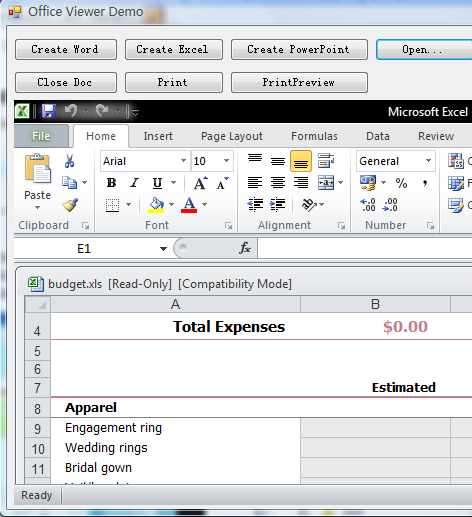 Edraw Office Viewer Component provides a solution for developers to host Excel program in a window or web page. The component offers the New, Open, Save, Print methods. It has also wrapped some common-used excel automation interfaces. More importantly, the component has the ActiveDocument dispatch interface which means the developers can do the Excel Automation with it. Now the Office Viewer Component can supporte seamless integration with Office 97, Office 2000, Office 2003, Office 2007 and Office 2010. Adds a new worksheet to an opened Excel file. Deletes a new worksheet from an opened Excel file. Activates the worksheet by the index. Returns the counts of worksheets in the opened workbook. Populates a specified cell with a string value. Returns the contents of the specified cell. Sets the height of the specified rows. Sets the width of the specified columns. Inserts a new row after the specified row. Inserts a new column after the specified column. Inserts a page break after the specified row. Inserts a page break after the specified column. Copies the whole sheet to clipboard. Inserts data to the worksheet like clipboard. Many developers are familiar with the excel automation in VB, C#, VC or Delphi. That is very good. It will help you get started rapidly to write code using word automation capabilities in office viewer component.